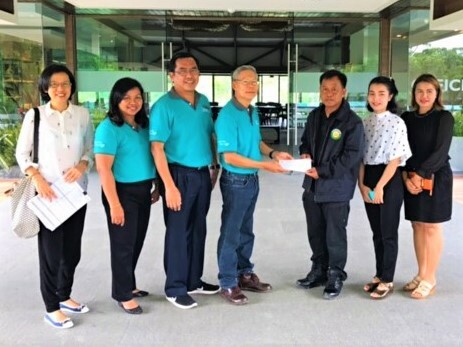 The Manager of Chanthaburi Farm Co. Ltd. Khun Prayut Punnasri presented a cheque at THB 250,000 to the Deputy of Tubsai Sub-district Lt. Col. Wichit Saeng-ngam at Chatrium Golf Resort Soi Dao to aid in the restoration of the local wildlife’s food sources encompassing 5 provinces in the East of Thailand in ensuring that the local fauna have a sustainable food source to allow them to flourish. This prevents them from intruding into the human world foraging for food which causes both a danger to themselves and an inconvenience and disturbance to the localpopulation. This project was initiated to celebrate the upcoming 85th birthday on August 12th of Her Majesty Queen Sirikit due to her lifelong love of protecting Thailand’s forest resources and wildlife preservation and will be carried out over 5 interconnecting provinces in the East of Thailand.